On arrival in Delhi meet and greet by our representative in Indian traditional with garlanding and escorted to Hotel. Check in and overnight stay. After morning breakfast proceed for full day guided sight seeing tour of old and New Delhi. Covering the Red Fort (passed through) ,the Jama Masjid, Jantar Mantar, India Gate the Humayun's tomb, the President House, the Qutub Minar. Overnight stay. Morning after Breakfast depart by surface to Jaipur - the fabled “pink city” of the desert named after Jai Singh, the former Maharaja of Jaipur. This is the only city in the world symbolizing the nine divisions of the universe through the nine rectangular sectors subdividing it. The palaces and forts of the yesteryears, which were witnesses to the royal processions and splendours are now living monuments. Arrive at Jaipur & check-in to Hotel. 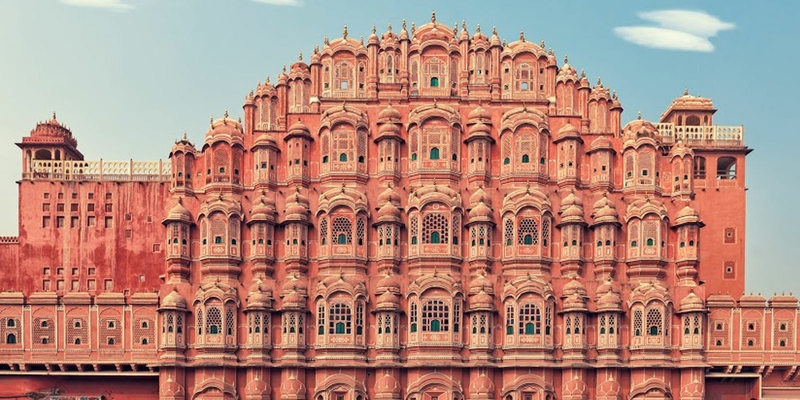 Afternoon city sightseeing of Jipur visit – City Palacee, Jantar Mantar, Hawa Mahal & Birla temple. . Overnight stay. After a breakfast and check-out from the hotel. To visit the majestic Amber Fort. Ride up on Elephant Back to the former capital of the royals set against the backdrop of the wooded hills. Further proceed by surface to Agra. 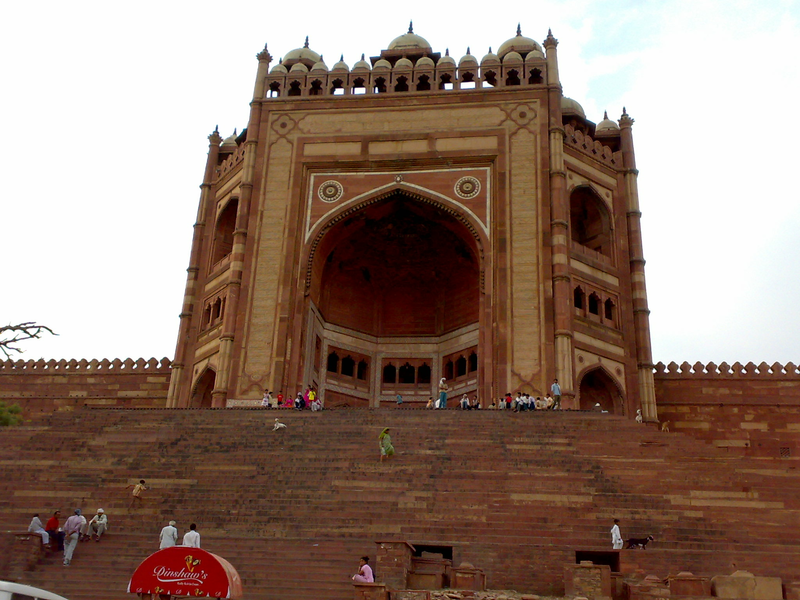 en route we visit Fatehpur Sikri the deserted red sandstone city built by the Mughal Emperor. Arrive and check-in to hotels. Overnight stay. Early Morning visit Taj Hahal (built by the great emperor Shah Jahan in the loving memory of his beloved deceased queen MumtazMahal ) by the Sun Rise, Return to the hotel. 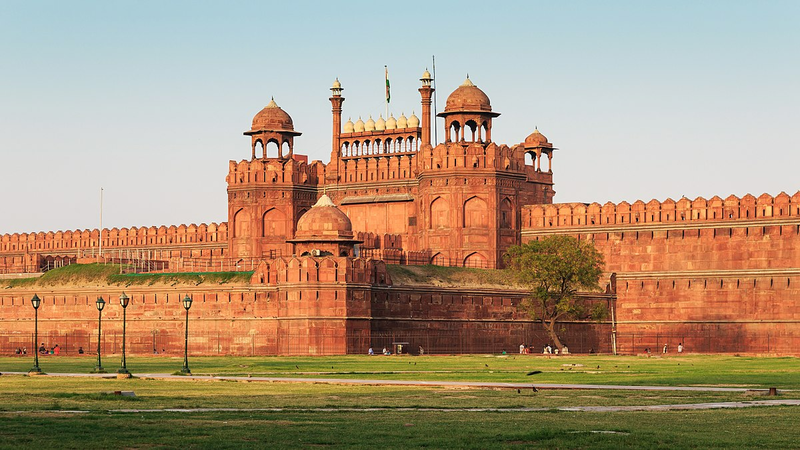 After breakfast visit Agra Fort (also built by the great emperor Shan Jahan) wherein one visits the House of Lords Diwan-e- Khas& the house of commons (Diwan-e- Aam) & Free for shopping. Evening at leisure. Overnight stay. Morning after breakfast transfer to Agra Cantt Railway Station to board train for Jhansi. Arrive and do sightseeing of Jhansi and proceed by surface to Orchha arrive and check-in to the hotels. 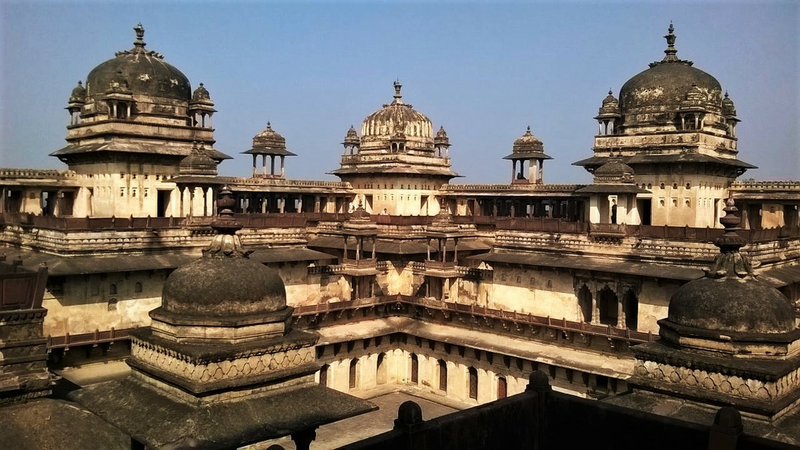 Visit Orchha - it was the capital of the Bundela Rajputs between 1531 and 1783. 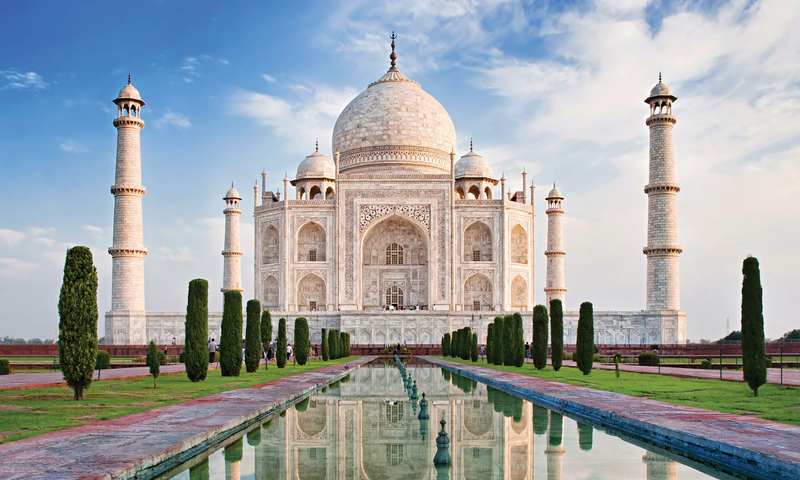 The palaces and temples built by them retain much of their pristine perfection. Some of the palaces were decorated with painted murals which represent the finest flowering of the Bundela school of painting. 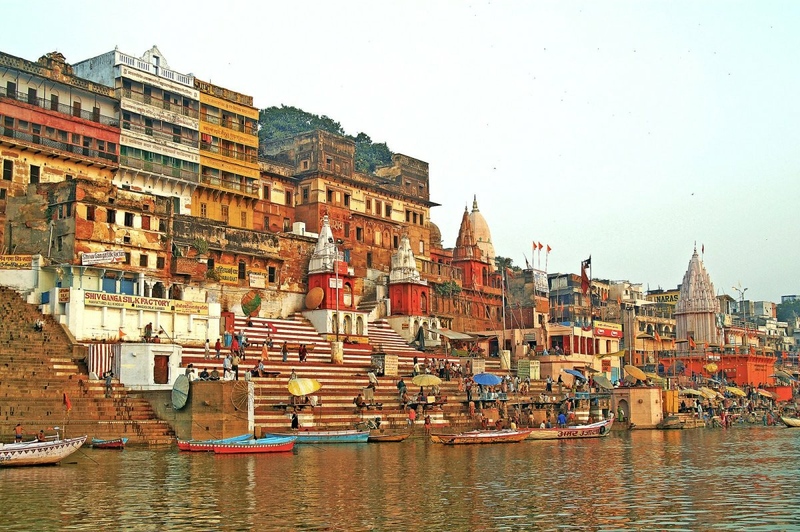 Jehangir Mahal, Raj Mahal, Ram Raja Temple, Chaturbhuj Temple, Laxmi Narayan Temple Overnight stay.. Morning after breakfast drive to khajuraho, on arrival check in at the hotel. After freshen up proceed for a sightseeing tour of temples. 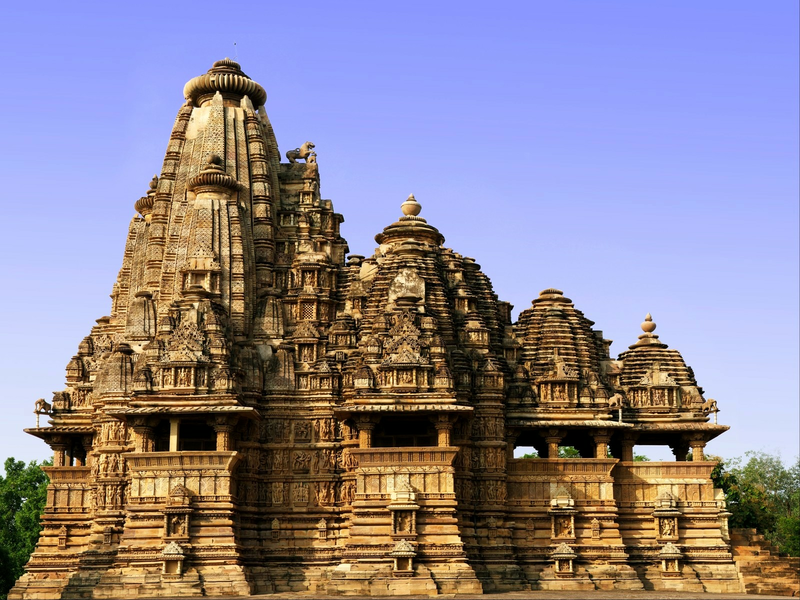 The Khajuraho temples were built in the span of a hundred years, from 950 - 1050 AD, in a truly inspired burst of creativity. Of the 85 original temples, 22 have survived till today to constitute one of the world’s great artistic wonders. Kandariya Mahadeo Temple is dedicated to Lord Shiva. Other temples in the group are Chausath Yogini, Chitragupta, Vishwanath, Lakshmana, Matangeshwara, Devi Jagadamba, Parvati, Lakshmi and Varaha temples, each with its own history, presiding deity and points of interest. The eastern group consists of three Jain temples in an enclosure and four others scattered around the old village of Khajuraho. The southern group has two temples – the Duladeo, which is fairly close to the Jain (eastern) group, and the Chaturbhuj temple, adorned with a huge, intricately carved image of Lord Vishnu. Overnight stay. Morning after breakfast transfer to Airport to flight for Varanasi. On arrival met with and visit Sarnath. Followed by sightseeing of Bharat Mata Temple is a novel temple dedicated to Mother India, which instead of the customary gods and the goddesses houses one of the most perfect relief maps of India carved out of marble. Evening see the Aarti Performance at River Ganges Overnight stay in hotel. 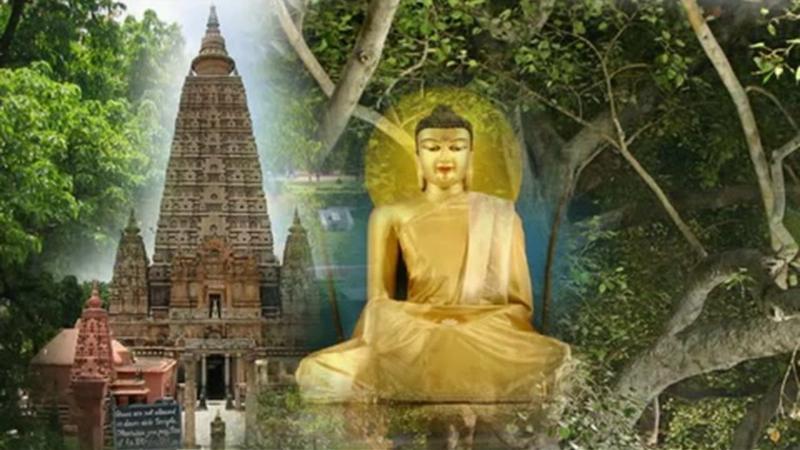 Morning after breakfast proceed for Bodhgaya is one of the holiest Buddhist pilgrimage centres, the "Bodhi" tree Satabodhi temple, Japanese and Tibetan monasteries along with Magadha university musuem are also to be visited. Overnight stay. After early breakfast, leave for Kushinagar. Long drive Enroute visit Rajgir , Nalanda and Vaishali. Visit Gridhrakula, Sapataparni cave, Ajatsatru fort and Venuvana. 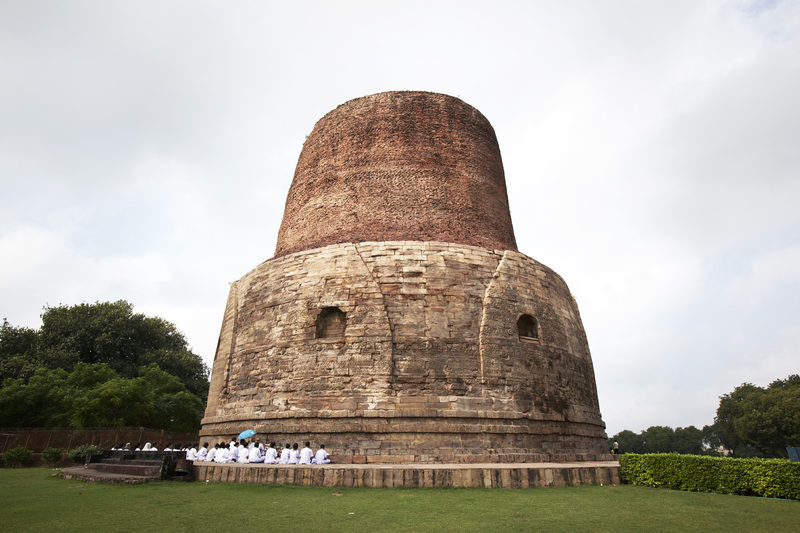 Also visit Nalanda and monasteries and temples with impressive Buddhist & Hindu images. The Institute for research into Buddhism and Pali literature which houses rare manuscripts, is also worth visiting for the enthusiasts. Arrive and check-in to Hotels Overnight stay. Morning Sightseeing of Kushinagar. 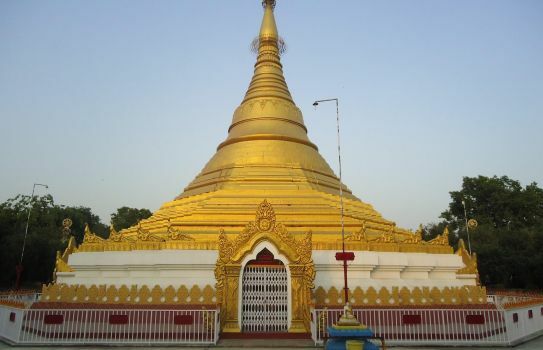 Kushinagar is where the Buddha finally attained Mahaparmirvana. 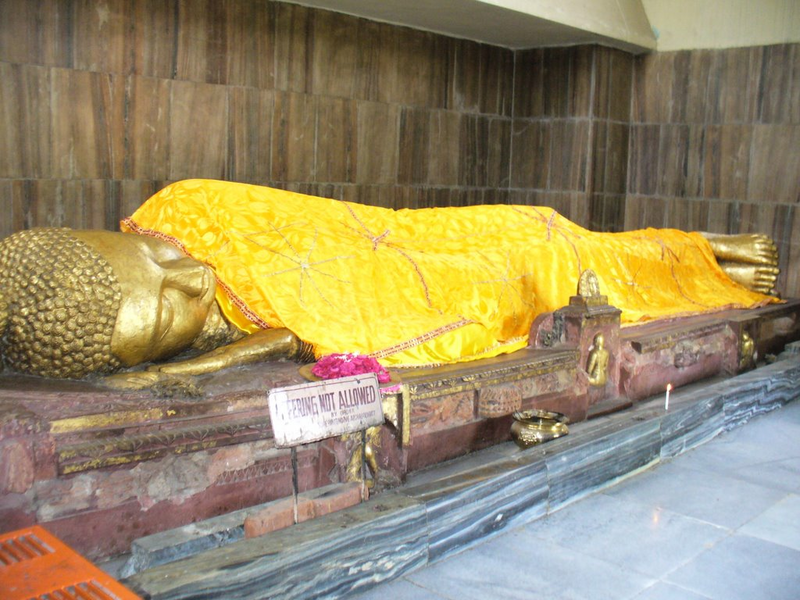 Amongst the ruins are the Mukutbandhan Stupa and a beautiful statue of the reclining Buddha visit Nirvana Temple Ramabhar Stupa & Cremation site of Lord Buddha Afternoon proceed by Overnight stay. Morning sightseeing of Lumbini. 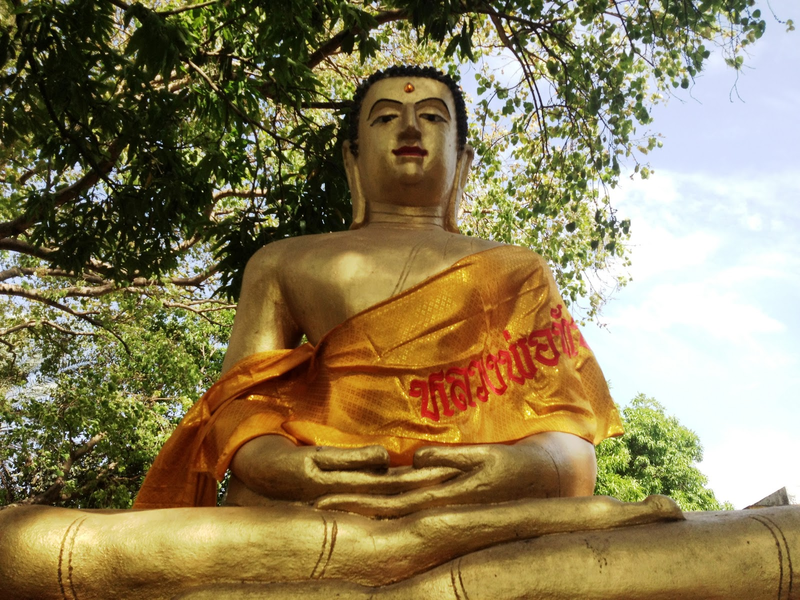 Visit the birthplace of the Buddha, was located in 1890 after being untraced for 1,500 years, enroute visit Kapilavastu -. Noon hrs. 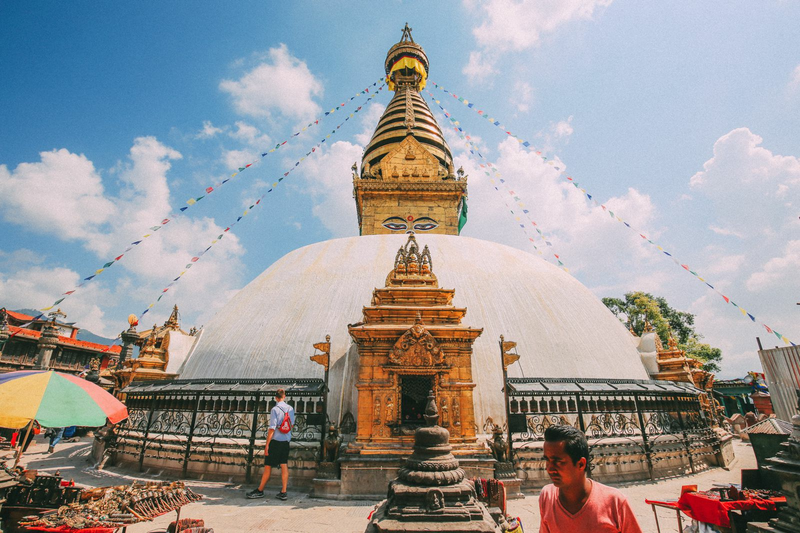 transfer to Airport to connect flight for Kathmandu- On arrival met with and proceed for sightseeing of Pashupatinath and Baudhnath. Overnight stay..
After breakfast proceed to visit Bhadgoan, also known as Bhaktapur. 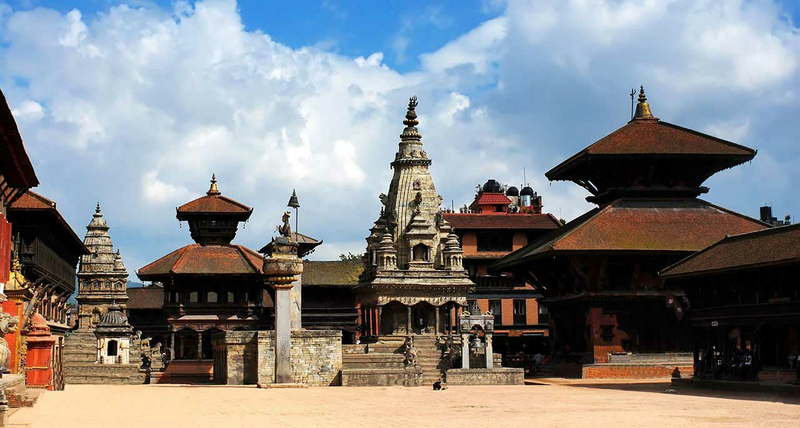 The Durbar Square is a conglomeration of pagoda and shikhara style temples. 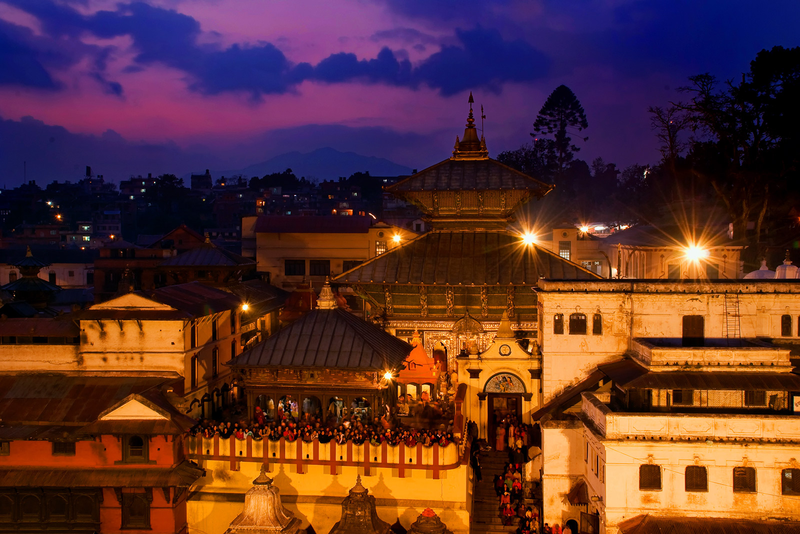 The square is one of the most charming architectural showpieces of the Valley as it highlights the ancient arts of Nepal. You will visit the The Golden Gate – which is said to be the most beautiful and richly moulded specimen of its kind in the entire world. Over night stay.